A piece of my mind. : A relief for the homeless? Mind Tonic is full of creative remedies by product innovation and buzz marketing specialist Dean Dempsey - chief inventor, entrepreneur, marketeer, agency partner and start up business consultant. Please keep an open mind. A relief for the homeless? After years and years of shouting “Big Issue” at passer-bys, they may now have a new-line to say! 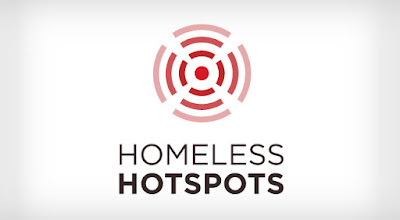 BBH New York are trailing an interesting concept which turns a homeless individual into a 4G hotspot. Customers can then pay the vendor cash, or pay online using paypal to use the service. All the proceeds go straight to the individual. Visit http://homelesshotspots.org/ to learn more about the project. Some may argue that this idea makes it ‘too easy’ for vendors to make money. However, they will have to stand still for a long period of time, as to not make customers 'out of range'. Plus, this scheme would probably be less successful if utilised in places such as London, where free Wi-fi connections are plenty. However, it has definitely got me thinking ‘What else is there that homeless people can provide? - Where is there a need?” We're at a time when there's plenty of freebies flying around (i.e. newspapers, on-line publications, free wi-fi hotspots) so what ELSE is there? Over 15 years experience as a business leader, award winning marketeer. Authority on Business & Brand Strategy, Innovation, Concept Creation, Business Solutions, Content, Buzz and Experience Marketing. Mind Tonic by Dean Dempsey. Simple theme. Powered by Blogger.